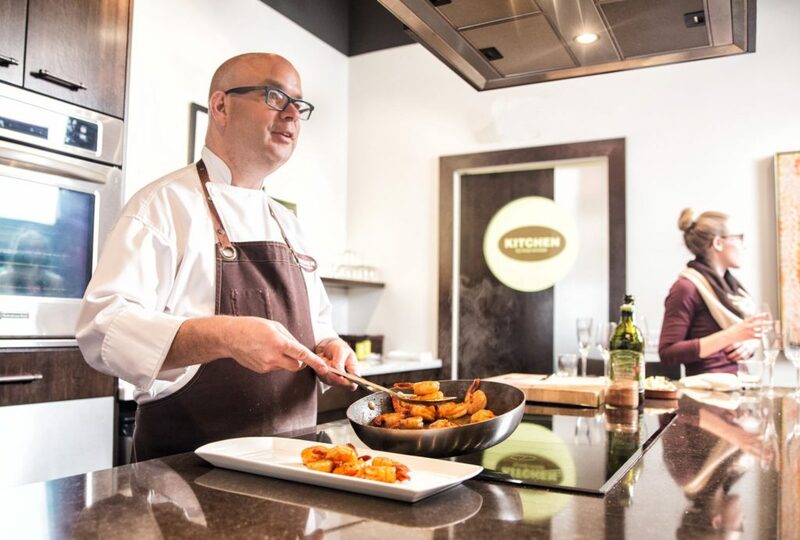 KITCHEN by Brad, which opened April 2012, is a culinary studio in the heart of downtown Edmonton which serves up a variety of kitchen parties, winemakers dinners and cooking classes. I interviewed its owner and founder, Chef Brad Smoliak, a longtime leader in the Edmonton food scene, to find out more. While my kitchen skills are definitely lacking, I definitely have one thing in common with Chef Brad, and that is we were both born and raised in Edmonton. For myself, growing up in Edmonton has been a labour of love. When I was younger, I couldn’t wait to get away and move somewhere “exciting”. But over the past few years, I’ve really noticed a shift in my attitude towards Edmonton. Perhaps that is something that came with age, but I’m sure a grander part of it is, simply, the food. Edmonton’s food scene has exploded over the past 10 years, and small independent restaurants are stepping up to meet the people’s demands for local food. And with food, comes community. The act of coming together at a table, to eat and share together, is not unlike the way Edmonton is really starting to come together as a community. Recently, there have been several positive, grassroots movements that have both beautified this city and made it a place we’re proud to live in. And maybe, perhaps, we realize the magic that has been hidden in front of us all along. Chatting with Brad over a cup of coffee made me even more energized about what’s already here in this city and what’s still to come. How would you describe KITCHEN by Brad to someone who’s never heard of it? It’s real cooking in a comfortable atmosphere. As a kitchen party food is a big component of it, but the company and visiting with people is important too. Where did you start out as a chef? What restaurants have you worked at? I started out at the Westin, Royal Mayfair and Earls, working my way up to kitchen manager. In 1996, Hardware Grill opened and I was co-chef and co-owner there. What (or who) motivated you to start KITCHEN? I was doing cooking classes out of people’s homes in 2006, but it’s really hard going into people’s homes to cook because you don’t know their kitchen. I was also doing lots of research in product development and I saw a place in Boston that did cooking classes and kitchen parties, and I wanted to open something similar. So I got this place on Jasper Ave and do the kitchen parties and classes in the front, and research and development and consulting work in the back. Tell me more about your events and classes. We do cooking classes for any kind of cuisine except for tofu and sushi dishes. One of our most popular classes is Baba’s Cooking, a Ukrainian cooking class. We also have a grilling class with Corey from ACME Meats. Our winemakers’ dinners pair food with wine from all around the world—-from Kelowna to Germany. Over the years we’ve been fortunate to visit vineyards in the Okanagan and Italy. All the food products we source are relationship-based and this goes with beverages too. We like to visit lots of places to source products from there to see the whole story. Why is it important to you to teach people about cooking? I think cooking is a lost art. People nowadays spend too much time at computers instead of eating and conversing. I think cooking is a skill at so many levels—-social skills, life skills, and also just feeding the soul and making people happy. What’s coming up for KITCHEN? We’ll continue with a lot of the same kinds of classes, but also venture into teaching ready to go meals. We also want to grow with Edmonton’s booming tourism market—-there are a lot of opportunities there. What are the biggest struggles you’ve had to face as a chef and local business owner? There’s a lot of red tape with regulations and permits to get through—-less to do with operations but more with setting up. Banks don’t particularly like to finance restaurants either. But Edmonton has been a great support. We have great neighbours here, and great landlords. What’s your commitment around locally sourced food? Food isn’t just about where it comes from, it’s about the whole package, about the relationship we have with that producer. A few of the local suppliers we work with are: Irving’s Farm Fresh, Fairwind Farms, Gramma Bee’s Honey, Kuhlmanns Farm Fresh, Wilding Road Cheese, Cheesiry, Aspen Ranch, Sylvan Star, Spring Creek Farm, Mountain View Farms, The Little Potato Company, Ocean Odyssey Inland, Brassica Mustard, the Italian Center Shop, and various venues from the Market on 104th street. Is there anything you do to be a greener, more sustainable business? We try to minimize waste and use all of the product we have in some capacity. For instance, we make a cheese oil out of the cheese rinds we’d otherwise throw out. We use very little plastic in the kitchen and all of the equipment is energy efficient. Make it easier for small businesses to start up and support them through that process. We were the first to combine cooking classes, wine dinners and private dinners in Edmonton, and since there was no baseline for that in our city, starting up was a real process. The Alberta Gaming and Liquor Commission (AGLC) could also be more supportive of small business. What’s your take on the Edmonton food and restaurant scene? Mostly—wow. It’s improved so much even since we opened Hardware Grill in 1996, and especially since 2005. There’s so many small independent restaurants instead of big box chain places. When you’re not cooking up yourself, where in Edmonton do you like to go out to eat and drink? There are so many different places in Edmonton, so it depends on the mood. We don’t dine out a lot, only when we don’t feel like cooking ourselves, so it’s usually somewhere casual. Local chefs in Edmonton are amazing, go out and support them! That’s a sentiment I think we can all get behind. You can find out more about KITCHEN’s upcoming classes on their website. To stay updated on what’s going on, follow KITCHEN on Facebook, Twitter, and Instagram.